James Sullivan takes a closer look into the world of triathlon as he has a chat with Irish Olympian Gavin Noble. Gavin Noble is an elite triathlete from County Fermanagh, Ireland. He represented Ireland at London 2012, placing 23rd, becoming the first Irish male to take part in an Olympic Games in triathlon. 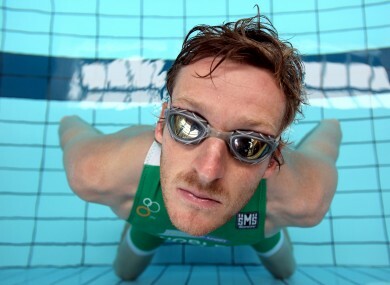 He also has represented Northern Ireland at the 2002 and 2006 Commonwealth Games, finishing 20th and 15th respectively. His best performance at a World Championship Series event was in 2009 at Yokohama, Japan where he ranked 11th. James: Thank you for taking the time to talk to The Running Review. So to begin, how did you first get involved in triathlon? Gavin: I began while at School as part of a relay team for “Ulster Schools’. Portora Enniskillen dominated those and subsequent schools championships. James: What other moments from your career to date are you most proud of? Gavin: I have had highs and lows. I am actually quite proud of my longevity. That longevity encompasses a lot of things and so it would not have been possible without reaching and striving for new heights. James: What would you describe as the most disappointing moment in your triathlon career? What positives have you taken from it? Gavin: I missed out on Beijing and took it badly but I learned from it and it gave me a mental strength while being on the road, racing and training. Sometimes, especially when you do most of your training, travel and racing alone, your mental strength is what separates you from others. Gavin: You have to look at Triathlon as a singular sport. From when the gun goes every action and effort effects the next. I actually think I have improvements to make in swimming even though people may think that it is one of my strengths – if you can swim faster without any extra muscle bulk then you can save matches and buy yourself time for the bike and run. A good run in a triathlon depends on how many matches you have to play with once you get there. James: What are your goals for 2013? Are you satisfied with how you have begun your year? Gavin: I have not ‘begun’ in 2013. I had a knee operation in September and I am yet to resume run training. It has been a long 7 months. I basically have not run properly or been pain free in over a year but I couldn’t have the operation until after the Games, so it was a tough season with most of my running only ever done in the races. I have been lucky to work with many understanding physios who have also acted as psychologists! I also gained a youtube degree in kineiso taping!! So I am doing a lot of rehab and I moved to Dublin especially so I could be close to the Institute and benefit from the expertise there. So I will look to a late summer programme of racing and anything before that will be a bonus and a race that is part of my ‘preparing to race again’. James: What would an average week of training be like, specifically in terms of key sessions? Gavin: I have changed my thinking in the last few months. Before I worked in ‘weeks’, wanting to have a routine of numbers, hours and sessions – a 7 day cycle set out by the rules of life and time. But I find that this makes me a little obsessive and I neglect how I am ‘feeling’. I would feel guilty missing a sessions or not performing because I was tired or I had accumulated too much fatigue. It would be different if I had a squad or all my sessions were coached. Then there is routine and by having others around you it means you can use the energy of the group. But when you are more often alone, those 3 hour bike rides for example on a dreary morning are tougher on the body. So at the moment I am working a lot in ‘blocks’ and having some fluidity to change. Sometimes I might even switch days around based on the weather forecast. I have a rule that I must have a rest day after every 10 days of training and that is when i’ll plan the next block. Within those 10 days I have an emphasis and blocks of 3 or 4 days with easier active recovery sessions linking them. I believe it takes at least 6 weeks to change anything physiologically and because I have three sports to consider I cannot ‘do everything’ – for me, that leads to injury and too much fatigue. I try to combine sessions (swim/gym, swim/bike, bike/run etc) and often work a similar energy system during the day. As I get closer to racing those become specific sessions for the demands of triathlon. A swimmer, cyclist or runner may have 2-3 key sessions during a week – I have those 2-3 key sessions also but spread over the 10 days. Gavin: I love track running with others, build runs or hard group rides. But I also love easy social recovery days! Something like a short hard bike followed by 3 x mile maybe or an easy 90 minute spin to a café. My least favourite sessions are those when its grey and raining but they need to be done and if those days beat you well then . . . . Also with the load of biking and running some days you jump in the pool and feel like a brick! Those are unpleasant, especially if you are in a swim squad and getting it handed to you by a 14 year old. Luckily the squad I sometimes swim with in Dublin recognise I am a triathlete and those days outnumber the days when I am swimming rather than struggling. My only complaint and it is a regular one that I voice, is why do swimmers insist on starting at 5am? James: Nutrition obviously plays an important part in the life of a professional athlete. What would be your typical dieting habits in the lead up to a big race? Gavin: I recognise the fact that I eat too much crunchy peanut butter and drink too much coffee. That being said I always eat according to what I have just done or what I am about to do – those are the rules. I am fairly balanced – everyone knows what’s good for you and what’s not, everything in moderation. I would always eat a large breakfast and that would be my main meal of the day. This morning, in the mix, was oats with coconut oil, milk, an egg white, frozen berries, peanut butter, raisins, maca root powder and cinnamon, with a coffee – that kept me going for a few sessions! My only real pre-race routine would be staying away from meat the day or two days before. I supplement with a few things and on race day I will have finished eating 3 hours before the start – normally porridge, some honey, maybe an egg for a protein portion, with fluids being important (over the course of the race week). I am an ambassador for Lucozade Sport and so I am looking forward to their new range of products for 2013. I would not use ‘product’ in every session, more so when the tough gets going or the load is very high. Sometimes in the lead up to a race with less training time there is a tendency to over eat (through boredom!) and I can be guilty of that but sometimes your body needs that bag of jelly sweets right!? James: Is Kona something which you would like to do in the future? James: Triathlon is a notoriously expensive sport to compete in at the highest level. How do you fund yourself? Gavin: I am funded by the Sports Councils for my training and racing programmes and I have some great sponsors which include Specialized, Vodafone, Lucozade Sport and Champion System. I also have a great relationship with Base2race in Ballymount and the Institute of Sport so I have all my sporting needs covered. I also have a ‘French Team’ and of course you make your money from racing. I also do some coaching days etc and recently have started writing for iamspecialized.com. You have to market yourself in sport – find ways of giving value to sponsors – only one man can win the race so what does the other 59 guys do to eat if it is not your day!? You can definitely make a living from our sport but it is a short term project on the grand scale of things so you have to maximize it. James: What can be done to break down the high expense barriers to participation to get more people involved in triathlon? Gavin: Triathlon does not have to be expensive. It is like any other sport, you can always participate accordingly. Of course plenty of people have lots of nice kit but a simple bike, helmet and 60% of the time a wetsuit is all you really need that you may not already have. I was in Base2race recently and the guys were trying to put off a customer buying the most expensive product because they felt it was not the best one for them! Entry fees and membership costs are lower than most sports and the fact in recent years triathlon has seen an explosion in the number of events and participants points to the fact the people are not ‘put off’ by any of the ‘barriers’ that one may envisage. James: How would you describe the state of triathlon in Ireland right now? What can be done to make the sport grow further? Gavin: We are in a very healthy state at the moment. The Sports Council has awarded the sport an increase in funding and the number of clubs, races and members grows year on year. We have a new CEO, new national sponsors, a thriving junior set up and even though I read recently that we had lost our Performance Director to another sport, a new energy can help progress the Performance side of Triathlon also in the next Olympic cycle. Creating an environment where athletes or race organisers can thrive is the goal of every sport and I think at the moment Triathlon Ireland are very much motivated to create and sustain that. I would love to see more youths and juniors in the clubs around Ireland but I also recognise the challenges for a club to incorporate and provide for junior members. When I was starting out there were Ulster and Irish Schools races and it would be great to see those re-emerge. James: What are your thoughts on the current format of the World Championship Series? Gavin: I enjoy it of course. It means the best athletes race regularly together. The series is like the formula one of triathlon. There are other race formats but none come close to the depth of talent or professionalism of the World Championship Series in my opinion. An athlete should be judged on were he or she stands in the World. Not on one continent, not in a different format to the recognised Olympic event. There are lots of races of course and lots of great performances but all those races are just preludes to the main dances. That is what the series tries to do and is all about. I guess it would still be good to have a ‘one off’ championship race, one day, one course, one effort, but economically and to grow a sport and maintain/market athletes a series is often best. James: Some people believe that drafting should be made illegal in Olympic distance triathlon, due to the fact that it causes gains in the swim to be negated very quickly, and that it makes gains on the bike very difficult to achieve. What are your views on drafting in triathlon? Drafting can of course aid weaker cyclists but then drafting also aids weaker cyclists in the Tour de France! We could have a time trial but I will guarantee you that internationally the same athletes will be at the top. If you have ever done a drafting race you will know that gains in the swim can be maximized because of drafting packs. Your day may be over if you do not swim well and that is an argument against drafting, often made by weaker swimmers! You don’t have people complaining about Mark Cavendish sitting in all day and sprinting for the line in bike racing. You play a sport according to the rules that are set out and you adapt your training to meet the demands of competition if you want to be successful in it. If it is a non drafting format then you train differently with more of an emphasis on time trialing on the bike. If that is the format you enjoy then that is the format you should pursue. Triathlon, I do not believe, is a swim race or bike race or run race. As I said before every action or effort in a race has a knock on effect. People complaining about the format of something or the rules, for me, it’s just a sign of their own insecurities or weaknesses. As my sister would say “end of’. James: What one piece of advice would you give to somebody, regardless of age or ability, looking to attempt a first triathlon? Gavin: The first step is always to enter a race. That is the primary commitment that needs to be achieved for any first timer. From there you have a time scale that you can work with. There is a lot of information out there, a lot of resources for advice but I think entering the race is key. James: That’s great Gavin. Thank you for your time and the very best of luck for the rest of 2013. Gavin: Don’t tell Base2race I told you that they often don’t want to sell you the most expensive one. Keep up to date with Gavin’s training and racing through his official website.